If the Detroit Lions are going to turn this thing around the second half of the season, the offensive line, more than any other unit on the team, needs to play dramatically better than they have the first half of the season. Detroit's line is allowing too many hits on quarterback Matthew Stafford, and providing too few holes for running back Ameer Abdullah and Co. to run through. The Lions own the 31st-ranked offensive line according Pro Football Focus. The site recently ranked all 32 units in the NFL. The Lions are 29th in pass blocking, 26th in run blocking and 20th in penalties. Their highest rated player - guard Manny Ramirez - doesn't even start for them. No player along Detroit's front grades better than 19th at their position by the website. This was supposed to be a young, athletic line that would start strong and only get better as the year went on. It hasn't worked out that way and now it's up to new offensive line coach Ron Prince to get things in order. The former tight ends coach has taken over the reigns in the offensive line room since former offensive line coaches Jeremiah Washburn and Terry Heffernan were relieved of their duties before the trip to London. "He's definitely one of the smartest people I've ever met," tight end Brandon Pettigrew said of his former position coach. "Big on details. "Overall, he's probably the best coach I've ever had." That's certainly high praise from Pettigrew, and he's right about Prince being a stickler on the details. "He's a little more straight forward and to the point," right tackle LaAdrian Waddle said of Prince. "He'll keep it real with you. If you didn't do your job, he's going to let you know about it. "We have to make those tiny little details count. We have to pay attention to the little stuff. We can't be short on stuff anymore." It's the little things, and the details, Waddle says, that Prince has been working to improve over the last two weeks. 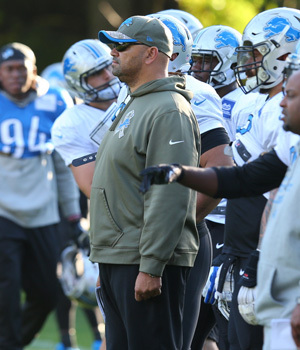 "Obviously, anytime that you make changes, you're going to get a little difference in personality, a little difference in style, a little difference just in terms of experience and background of dealing with the guys at the position," head coach Jim Caldwell said when asked what Prince brings to the offensive line room. "It takes a little adjustment for the guys up front because he does have a little different style, but I think it's been constructive." Starting left guard Laken Tomlinson said fans would have to wait and see Sunday when asked how much effect Prince has already had in that room. Pettigrew thinks Prince will get the best out of the unit. "His approach on coaching is excellent," Pettigrew said of Prince. "It's hard to describe but he has a method of taking each player and kind of molding his coaching around that player. You can't really coach every player the same. He just has a right way of doing that. "One thing I do know is he's going to do everything he can to make sure that everything is understood down to the small details of the game plan. At the end of the day, (the offensive linemen) are going to have to buckle down and learn it and get with it."